RAMW annouced yesterday that Summer DC Restaurant Week will be from August 15th through 21st. The complete list of restaurants is here. Of course, some restaurants will have a special deal for the whole month. Stay tuned for us to post more details and menus here. In the mean time, for those of you that make reservations in advance, let the race begin! You may want to check what restaurants have historically offered to patrons in our past DC Restaurant Week Menus to give you an idea of where you should try this year. Well, here we go again! It feels like Summer Restaurant Week just ended and here we are starting all over again with Winter Restaurant Week. As you're probably already well aware, January Restaurant Week in 2011 will be from January 17th through January 23rd. As usual, we at DCFoodies.com are contacting all of the restaurants gathering all of the restaurant's menus in a single place for your convenience. We will make this reference as conclusive as possible so our readers have all the details they need to make a decision about where to dine. As we receive more menus, we'll continue to update this throughout the month. If you are looking for advice about where to go, or are wondering "What the hell is this Restaurant Week that everyone's going so crazy over?" please refer to our guidelines on DC Restaurant Week. Also soon to come is our list of restaurants that are extending DC Restaurant Week! 2941 will be offering the Restaurant Week price for a three-course lunch from January 10th to January 31st. There lunch menu is here. Menus for Lunch and Dinner are posted on their web site at http://701restaurant.com/. Click on "Events" and then "Restaurant Week". Their lunch menu features a Chestnut and Mushroom Soup and Duck Confit. For Dinner you will find a Beef Cheek appetizer with Truffled Sweet Potatoes and Caramelized Apple. Sounds yummy! Againn is extending restaurant week from January 10th to the 30th. Here are their restaurant week menus. Barcode is extending DC Restaurant Week for an additional week until January 30th. They're also mixing things up with the offer. For lunch you get 3 courses instead of the usual 2, with free coffee or tea. For Dinner you get 4 courses instead of the usual 3. In addition, for dinner during the first week, you will get a free glass of any wine on the menu up to $9. For dinner the second week, all bottles of wine are half off (Barcode usually offers this on Tuesday nights). Belga Cafe has a very limited menu for both Lunch and Dinner. Bistro Bis is offering their full menu with some up charges for a few items. Bombay Club's menu is on their web site now. After entering the site click on "events" and you will see the option for the Restaurant Week menu. Extending DC Restaurant Week until January 30th. There is no menu available yet, but we will post it as soon as it is available. Extending Restaurant Week until January 30th. Lunch and Dinner menus are on their web site. Ceiba's menus are on their Facebook page. Lunch and Dinner Restaurant Week menus are here. Chef Geoff's offers their whole menu during DC Restaurant Week. Co Co. Sala is extending the DC Restaurant Week offer until the 29th. Extending until January 30, Columbia Firehouse is also offering Brunch on Sundays. Extending DC Restaurant Week an extra week until January 30th. DC Coast's menus are on their Facebook page. Dino is NOT participating in Restaurant Week for the entire month like they have in the past. They have extended it until January 31st though and they offer their full menu. During Restaurant Week, they offer their "Wine Madness" program where you can get 33% of all wines over $50. This makes Dino an especially good deal during this time of the year if you appreciate fine wines. Also, on Sundays during Restaurant Week, they will be participating for Brunch as well. Domaso is offering 4 courses for dinner instead of the usual 3 for DC Restaurant Week. Extending DC Restaurant Week until January 30th and starting every table with a complimentary three cheese pizza. They will also offer their Sunday brunch for the Restaurant Week lunch price of $20.11. Firefly is offering a their full menu with a few upcharges. Below are their current menus. The Grill is participating in Alexandria Restaurant Week (the week following DC Restaurant Week) with the same menu so technically, they are extending the offer. Jackson 20 is participating in Alexandria Restaurant Week (the week following DC Restaurant Week) with the same menus so technically, they are extending the offer. Also, their beverage specials will be available during Restaurant Week including bottomless mimosas for brunch, Wine Down Mondays and their 20/20 wine list (20 wines for $20). These are their current menus on their web site. Jaleo is extending DC Restaurant Week until January 30th. There is no menu available as of yet. We will post it as soon as it is available. Extending DC Restaurant Week from January 10th through January 30th. From their web site, it looks like they're offering the same menu for both lunch and dinner.(http://kellaridc.com/special_menus.php). For lunch, Kinkead's is particpating in DC Restaurant for all weekdays during the month of January (starts January 3rd and ends January 28th.) For Dinner, Kinkead's is following the standard Restaurant Week days. This is the first time Kushi is participating in Restaurant Week, and they are extending it another week until January 30th. They will offer a four-course progression including the pork belly and duck sausage kushiyaki, wood-grilled maitake mushrooms, and sea-salt gelato. La Bergerie has extended DC Restaurant Week until January 30th. Liberty Tavern is offering their full menus for Lunch and Dinner. For both Lunch, M Street Bar and Grill is letting you choose any appetizer or entree from it's lunch menu. For Dinner, they are letting you choose three courses from their normal dinner menu. Lunch and Dinner Menus are posted on their web site. Nage is extending DC Restaurant Week the ENTIRE MONTH! Some example dishes include Smoked Chesapeake Perch Salad, Ricotta Gnocchi with Buffalo Mozzarella, and rich Doubleshot Espresso Tiramisu. Here is their full dinner menu. Occidental is extending DC Restaurant Week until January 31st. Restaurant Week menu will be posted here when it's available. Oval Room's menu is now on their web site. Click on "Event" and you will see a link to their Restaurant Week menus. Extending DC Restaurant Week until January 30th. Perry's is extending Restaurant Week until the 31st. Rasika has their Restaurant Week menus on their web site now. Click on "Events" to see them. Extending DC Restaurant Week an additional week until January 30th. Also offering a complimentary glass of house wine or draft beer during dinner. For Lunch, choose from dishes such as Southern-style Savannah Wings or the Cuban Sandwich with Slow Roasted Pork, Tasso Ham and Fontina Cheese. Or for dinner, choose from dishes like Fried Green Tomatoes with Goat Cheese, Green Tomato Relish, and Creole Remoulade, 16 ounce Bone-In Rib Eye with Mashed Potatoes, and Chocolate Bread Pudding with warm white chocolate sauce. Smith Commons is extending DC Restaurant Week until January 30th and offering a complimentary draught beer to each RW guest, 21 and over. Tallula is offering their full menu. Check their web site for the most current menu. Please note that Tallula always offers what they call the Neighborhood Nosh all night Sunday and Monday, and Tuesday through Thursday, 5:30 - 6:30. From their web site, "Enjoy a Three Course Dinner for only $35. Our entire menu is available for you to sample and discover!" Tosca is having a very large menu for DC Restaurant Week. They often fill up quickly because they are a popular option for Restaurant Week. Tuscana West is extending an extra week until January 30th. Urbana will be offering their full menu. Menus coming soon. For Restaurant Week, VENTO is offering four courses with your choice of Appetizer, Pasta, Entree, and Dessert. Here is their full menu. Vidalia is offering their full menu with some up charges for a few items. Wildfire's menus include your choice of soup or salad, a Wildfire signature main course with choice of a side, and dessert for $20.11 at lunch and $35.11 for dinner per person. Willow is extending DC Restaurant Week until January 29th. For Lunch, Zengo is offering a selection of Bento Boxes and a Signature Dessert. For Dinner, choose from One Small Plate, One Large Plate, and One Signature Dessert from their dinner menu. Every DC Restaurant Week, we at DC Foodies take on the grueling task of gathering up all the restaurants' menus and posting them here to save our readers time and heartache. To this list of menus is as comprehensive as we can make it. We search through web sites, contact PR people and restaurant managers, and even call the restaurants directly if we have to. For some restaurants, we don't ever get a response or call back, but I think that says a lot for how eager some restaurants are to participate in DC Restaurant Week. Click here to see which restaurants are extending DC Restaurant Week for Summer 2010. 2941 is offering their Restaurant Week Download 2941 Restaurant Week August 16-20 for the entire month of August. 701 Restaurant's menus for lunch and dinner are on their web site at 701Restaurant.com. Click on "Events" and "Restaurant Week". Acadiana's lunch and dinner menu can be found here for DC Restaurant Week. Lunch and dinner menus are here. Ardeo's dinner menu is available on their web site. Click on the Restaurant Week link on the home page to view it. Art and Soul is extending restaurant week until the August 29th! Their menus are available here. Details about what Asia Nine is offering for DC Restaurant Week are on their web site. Asia Nine has extended DC Restaurant Week the from August 5 through August 29. Basille is extending DC Restaurant Week an additional week until the 28th! Here is their menu. Bibiana's menus are posted on their web site here. Birch and Barley offers diners the option of adding three 6oz beer pairings to match each course, for an additional $16 per person. Their dinner menu is here. Bistro Bis has their menus posted on their web site. Click on "Menus" and select "Other Menus". Their menu is posted on their web site. Menu coming soon at www.bombayclubdc.com. Cafe Atlantico is extending Restaurant Week an additional week. Cafe Dupont is extending their DC Restaurant Week offering until the 17th. Their menus are available here. Lunch menu is on their web site. Click on the menu link in the lower right side of the home page. Cafe Promenade has their menus posted on their web site, however, please notice that they're not validating parking during Restaurant Week and day parking is $25! Ceiba's lunch and dinner menu can be found here for DC Restaurant Week. For those of your that don't know, my dogs name is Ceiba too. Chef Geoff's and Lia's offer their full menu for DC Restaurant Week. Their latest menus can be found on their web sites. Please note that Charlie Palmer Steak is only participating in DC Restaurant Week the 17th through the 20th. Their menu for Restaurant Week is on their web site here. Their extending an additional week until the 26th. Their dinner menu during DC Restaurant Week is here. Visit the DCCoast.com web site to see their menu. It's under the "Upcoming Events" link, and scroll to see the menu. As usual, Dino is participating in DC Restaurant Week for the entire month! Plus, they also are offering their "Wine Madness" program all month, where you can take 33% off all wines over $50. Take advantage of this deal! Their DC Restaurant Week menu will also include a trio of treats to start: crostino, soup shooter and devilled egg, plus a chocolate truffle and house infused grappa to finish. According to their twitter feed, Eatonville is offering their full menu for DC Restaurant Week. Check it out on there web site. Eola's dinner menu is available on their web site. Geranio is offering the same thing for Alexandia Restaurant Week (the following week) as it is for DC Restaurant Week. Appetizer options include an heirloom tomato gazpacho with blue crab, watermelon, and cucumber, a salade du Marché with Path Valley greens, baby carrots, cucumber, radish, grilled asparagus, marinated grape tomatoes, brûleéd goat’s cheese, and herb vinaigrette and braised Kurobuta pork cheek, served with brown sugar bacon, charred frisée, and roasted shallots. Entrées feature bouillabaisse with cobia, clams, mussels, tomato-saffron water and saffron aioli, braised boneless beef short rib, with carrot purée, pea purée, braised Cipollini onion and carrots, braised veal breast with glazed root vegetables, pommes mousseline, and morel mushroom jus, steak frites with grilled flank steak, fries and Cashel blue cheese butter, and mussel frites with Maine blue mussels steamed in white wine with house cut fries. Dessert options feature a warm peach cake with crème fraîche, peach compote and caramel sauce, milk chocolate pot de crème, and summer squash made with grilled zucchini bread with sweet crème fraîche, mint purée, and strawberry compote. Grillfish is participating in DC Restaurant Week the entire month of August. The details of what they're offering is on their web site. Harry's Tap Room in Clarendon is donating $5 for every dinner purchased during DC Restaurant Week to DC Central Kitchen. Here is their menu. J&G is extending restaurant week until the 29th! Their menu is not posted yet. Offering their fill Lunch and Dinner Menu. They're participating in Alexandria Restaurant Week as well, which is the following week. La Bergerie is also participating in Alexandria Restaurant Week, the week following DC Restaurant Weekwith the same menus. La Tasca does unlimited tapas during Restaurant Week. La Porta's is extending DC Restaurant Week until August 29th. No word yet on the menu they are offering to diners. La Sandia is offering their full menu for lunch and dinner. Lavandou is extending DC restaurant week until August 29th. Their menus are on their web site now. Liberty Tavern is offering their full menu. See their latest menus on their web site. Logan Tavern is participating the entire month of August. Details of what their offering for DC Restaurant week are here. Lunch and Dinner Menus are available on their web site here. Nage is doing DC Restaurant Week the entire month of August. Details about what they're offering can be found on their web site. Oval Room has their menu posted on their web site. Click on "Events" and then "Restaurant Week August 2010". Oya's menu for DC Restaurant Week is on their web site here. Oyamel is extending DC Restaurant Week an additional week until August 29th. PassionFish's lunch and dinner menu can be found here for DC Restaurant Week. Perry's is extending DC Restaurant Week until August 31. Details about there menu can be found on their web site here. Guests can choose from seasonal menu items like heirloom tomato gazpacho with dijon mustard ice cream, marcona almond and heirloom carrot salad with golden raisins and verjus, summer vegetable crepês with faro, corn, chanterelles, summer bean salad, goat cheese, and wood grilled capretto with Anson Mills polenta, sweet corn, and chanterelles. Dessert features a house-made market cobbler with choice of nectarine or blueberry and crème fraîche sorbet. Primi Piatti tell me they're extending through the end of August. Restaurant 3 is offering their full menu for lunch and dinner and extending until August 29th. Lunch and Dinner menus are on their web site here. Extending DC Restaurant Week until August 29th. Sam and Harry's is participating in lunch and dinner. For Dinner, you have three choices ranging in cost from $35.10 to $55.10. Their menus are here. Sonoma is offering their full menu with a few exclusions. Their menu can be found here. Sonoma is also extending DC Restaurant Week until August 26th. Tallula is offering their full menu for DC Restaurant Week. Guests can order anything from the "Firsts," "Salads," or appetizer portion of "Pasta" as their first course. For the second course, they can order any of the entrees or full portions of pasta, and any dessert for the third course. The only dishes excluded from the promotion are the cheeses, charcuteries and sides. See their current menu here and here. TenPenh's lunch and dinner menu can be found here for DC Restaurant Week. Tosca is always a good choice for Restaurant Week. They always offer their full menu and they're one of the better Italian restaurants in the city. Check out their menu here. Dinner menu is on their web site here. Offering their full lunch and dinner menus. Check their latest menus on their web site. Vidalia has their menus posted on their web site. Click on "Menus" and select "Other Menus". Vinoteca is also offering a wine pairing with their Restaurant Week menu for $25. Willow is extending Restaurant Week until August 28th. They're lunch and dinner menus are on their web site. Extending DC Restaurant Week an extra week until August 29th. For lunch, Zengo is offering one of their Bento Boxes. See the list here. For dinner, Zengo is offering their full regular menu. See their menu here. For those of you that waited too long to make your restaurant week reservations, you'll be happy to know that many restaurants extend DC Restaurant Week for an additional week or even participate the entire month! Here is the list of extensions that we have so far. We'll be updating this as more information comes in. Make sure you pay attention to this list when you're making reservations! We also post the menus of the restaurants that participate in DC Restaurant Week (Coming Soon!) so you don't run into any surprises when you arrive at the restaurant and find out they're only offering a small selection of their menu. To Happy dining everyone!! 2941 - Offering their lunch menu the entire month of August. Dino - Offering their full menu for Restaurant Week the entire month of August and "Wine Madness" where you can take 33% off any wine over $50. Logan Tavern - Entire month of August. Summer DC Restaurant Week - August 16th! This just in: The Restaurant Association of Metropolitan Washington has just announced that DC Restaurant Week Summer 2010 is set for the week of August 16th to the 22nd! In January, almost 180 eateries in the DC area took part in the year's first Restaurant Week, and this one looks to be the biggest yet, with just under 200 participants! Last season's terms will still apply: Participating restaurants will feature a prix-fixe, three-course meal (tax and tip excluded) for $20.10 at lunchtime, and $35.10 for dinner. With so many places to choose from, and only so many reservations to go around, picking RW dining destination can be a bit imposing, so we offer these bits of advice. 2) Go for the big and pricey! Hey, when is the next time you are gonna get a meal at Ruth's Chris for less than $40? Look for the $$$s and $$$$s on OpenTable and go for broke, though bear in mind, those ones book up fast. 3) Some restaurants put more into Restaurant Week than others. Some offer a bare-bones selection, hardly indicative of what they really can do. On the opposite end of the spectrum, a few offer the entire menu, giving diners the option of tasting everything the chef has to offer. Though one can never be sure ahead of time, take a look at last year's menus, as they should give you a good idea as to who goes all out for the occasion. 4) Many places extend the Restaurant Week pricing for additional month or two. If your time is short and you wanna cram a lot in, again, take a look at last year's menus and hold off booking those places that extended the deal, as they are more likely to do so this year as well. 5) Though it may be tempting to pick the trendy new spots on this year's list, consider giving it a pass. Restaurants have enough troubles within their first six months without taking Restaurant Week into consideration -- those that take it on too quick often prove unfit for the task, with lackluster service and questionable food being the end result. Give it some time, and stick to the tried and true -- if they are any good, the new guys will be around for this summer's Restaurant Week. 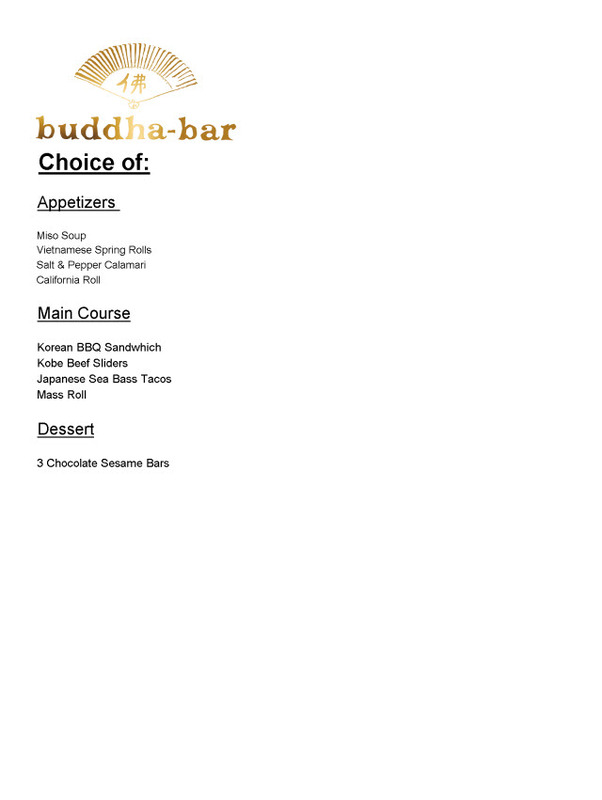 Of course, we will post menus as they come in -- so keep checking the site. In the meantime, take a look at our past DC Restaurant Week menu posts to get an idea of who you'll see, and who is bound to bring their "a-game." For a full list of participating restaurants, check out RAMW's homepage, and make your OpenTable reservations here. Good luck, stay smart out there, and happy eating! Better late than never...I guess. For those of you that wait for us to post this every DC Restaurant Week, I'm sorry for getting this up so late. You'll find later that the full list, but first, here is a list of restaurants I think you should try for DC Restaurant Week if you have not already. Dino - Dino is always a good choice for restaurant week. Especially if you can go on one of the wine madness days during Monday through Wednesday. They are offering the deal all month, so take your time. Willow - Willow really makes it worth the trip during DC Restaurant Week. They always have excellent service and the food is wonderful. There is still plenty of availability next week and the week after. Firefly - Firefly is offering a good portion of their menu and is another restaurant that makes it really worth the trip. Tallulah - I went to Tallulah and had a really nice meal. I think it's worth everyone checking it out. PassionFish - For those of you in Reston, I eat here for lunch pretty often and it's always very good. Here are the Restaurants that are extending restaurant week. Extending their DC Restaurant Week offering until January 31. There are two menu options, one for $35 and one for $50, which kind of defeats the purpose of Restaurant Week, but I'll let you make the call on that. Extending DC Restaurant Week until January 29th. Check their web site under "Events" then click on "Restaurant Week". Extending DC Restaurant Week an extra week until January 24th. Lunch and Dinner menus for DC Restaurant Week are here. Extending DC Restaurant Week to January 31st. Seems like their DC Restaurant Week menus will be here but are not posted yet. Bistro Bis is offering their full menu for Restaurant Week. See their web site for their current menu. Menu is on their web site. Click on "events" and then "Restaurant Week". Menus will be posted here. Their Restaurant Week menu will be found here when it is ready. Offering their full menu according to their web site. Offered their full salad bar and meat options until January 21st for DC Restaurant Week. Extending DC Restaurant Week and additional week and offering their full regular menu. Co Co. Sala is extending DC Restaurant Week until January 20th. Extending Restaurant Week until Jan 24th. They will also be offering Wine Madness as well so wines $50 and over are 33% off. During the official Restaurant Week, January 11 thru 17, they will not be offering free corkage (normally Monday through Wednesday) or Menu della Sera. For more details, look here. Dish is offering their full regular menu and is extending DC Restaurant Week until January 24th. Menus were posted to their web site last restaurant week. Keep an eye out. Guests that come to Farmers & Fishers for Restaurant Week in parties of 2 or more receive a free 3-cheese Farmhouse pizza on the house as a starter course in addition to the normal 2 or 3 courses for lunch and dinner. Menus for Lunch, Dinner, and Brunch are on their web site. Menu for dinner is posted on their web site here. Details on their DC Restaurant Week offering are here. Lunch and dinner menus are available here on their web site. Lunch menu is on their web site under menus and "Promotional Menu"
Offering Restaurant Week the entire month of January. If your entire table orders off the Restaurant Week menu, all bottles of wine you order are half price. Lia's full menu will be available. For more details, click here. Offering their full menu for lunch and dinner for the entire month of January. Dinner includes a glass of wine. See full details on their web site. Extending Restaurant Week and additional week. Lunch and Dinner menus are on their web site. Extending DC Restaurant Week through January 24th and offering their full menu. Menu is posted on their web site - click "Events" and then "Restaurant Week Winter '10"
Extending Restaurant Week until January 24th. Extending Restaurant Week until January 31st - Menu is posted on their web site. Lunch and Dinner menu are here. Policy is allowing guests to choose any 3 entrees from their regular menu as well as a dessert. Their current menu is here. Offering their full menu, check out their latest menu on their web site. Menus are on their web site - go there at your own risk. Menus are now on their web site. We have no details on the menus, but we know that Spezie is extending Restaurant Week until January 30th. Tallulah is quite enjoyable since Barry Koslow took over the kitchen. They are offering their full menu for Restaurant Week. Click here for their current menus. Unlike previous years,Vidalia is not offering their full menu according to their web site. Good luck getting a reservation...there months from now, let alone next week. Willow is extending Restaurant Week for an extra week until January 23rd. Their menu is on their web site. Willow is a personal favorite of mine. Offering their full menu for DC Restaurant Week. 4) Many places extend the Restaurant Week pricing for additional month or two. If your time is short and you wanna cram a lot in, again, take a look at last year's menus, and hold off booking those places that extended the deal, as they are more likely to do so this year as well. For a full list of participating restaurants, please visit the official website here. Stay tuned, as we will be rolling out the menus as soon as they become available. As you know, we at DC Foodies work very hard every year to gather all the menus for our readers to peruse and make their decisions on where they want to dine during DC Restaurant Week. Each year, we call around to the all of the restaurants and beg for their menus -- some restaurants respond and some don't. I guess perhaps it just shows how serious some restaurants take Restaurant Week. Mike already told you the guidelines you should use to decide where to dine during DC Restaurant Week, and here is the rest of the information you need to make your decision, the actual menus. We'll keep updating this every few days, so check back often to find updates. Cedar Restaurant - August 24st through September 6th. Offering 3 courses from their full menu August 1 through September 13 for $35.09 plus a free splash of house infused grappa or lemoncello & complementary crostini to start. There will be a few upcharges on the menu. Dino will also be offering Wine Madness: all wines $50+ are 33% off every night! Free corkage on Tuesday, Wednesday, and Thursday. During the actual DC Restaurant Week, Dino will not be offering Menu della Sera, Free Corkage or the Happy Hour discount August 24 - September 6 but they will they will offer all their regular discounts for the rest of the promotion. Offering a new menu each week the entire month of August. During the month of August enjoy a special four course summer menu (click for menu) at YAKU. Choose one item from each section and with the main course a glass of red or white wine. Available seven nights a week after 7pm beginning Monday, August 3rd. Extending Restaurant Week from August 17th to September 6th. summertime seafood a la Nage with half a lobster, littleneck clams, mussels, shrimp, chorizo, soybeans, potato, corn, tarragon and summer wheat beer. tangy frozen yogurt with heirloom cherry tomatoes, basil, balsamic and candied pine nuts. 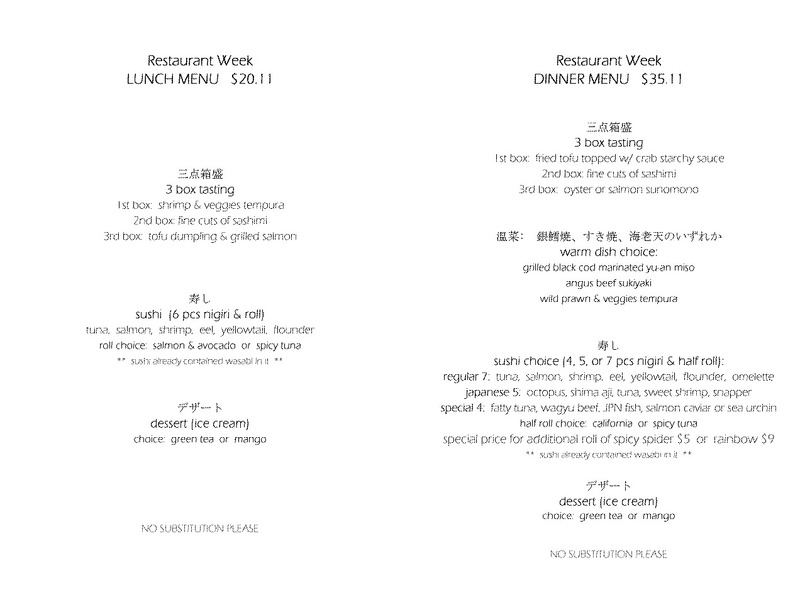 Offering Restaurant Week 2 different menus for lunch only. The menu will change half way through the month. The Chef Geoff's restaurants offer their full menu during DC Restaurant Week. See all of their menus at the Chef Geoff's web site. Extending DC Restaurant Week, however, offering a special menu in addition to their normal menus. Check their web site under "Events" then click on "Restaurant Week". Lunch and Dinner menus are on their web site. Also extending DC Restaurant Week through September 6th. Menus for Sam and Harry's and Caucus Room's DC Restaurant Week offerings can be found on their web site. Restaurant Week menus are now on their web site. As usual, Bistro Bis and Vidalia have their menu's posted on their web sites under "Other Menus". Vidalia is one of my favorites for Restaurant Week. Blacksalt is another one of my favorite places to eat. Even though they are only participating for lunch, it is worth a visit. Their DC Restaurant Week lunch menu is available on their web site. Menu's are now availabile on their web site for DC Restaurant Week. We've uploaded their menu to our own web site since it's not on their's. You can find it here. Hook is participating for both Lunch and Dinner unlike previous years. Their menus are on their web site. We've uploaded their menu because they don't have a web site. You can find it here. We've uploaded their menu because it's not on their web site. You can find it here. Their menus are on their web site. Willow's Restaurant Week menus are on their web site but hard to find and we can't link directly to them unfortunately. On the right bottom, click on "RESTAURANT WEEK SUMMER 2009 MENU & DATES". Lunch and dinner menus are fairly hidden on their web site. Look here. Interestingly enough, Mio is not actually listed on the official DC Restaurant Week web site. However, their web site and emails say that they are offering a different menu every week for the entire month of August. Check out their web site under Menus for the latest week's menu. Another restaurant not on the official DC Restaurant Week web site. Volt is participating for Lunch and Dinnerlunch only. We have posted their menu here on DC Foodies. Belga Cafe now has their menus posted on their web site. Occidental is extending Restaurant Week through the 5th of September. Their menus are not on their web site, so we have posted it to DC Foodies. Cafe Soleil's menus are not on their web site, so we have posted it to DC Foodies. Extending DC Restaurant Week through September 6th. Offering special 3 course menus in addition to their normal menu. Check out their web site for more details. Extending restaurant week from August 24 through September 6th. Check out their web site for more details. Ceiba now has their menus on their web site. Extending the Restaurant Week deal through September 2nd. Menus are now on DC Coast's web site. Menus are now on Extra Virgin's web site. Georgia Brown's menu is on their web site. Lunch and Dinner menus are now on their web site. Extending DC Restaurant Week from August 24th to September 5th. Dinner menu is available on their web site. Offering their full lunch, dinner, and dessert menus. Including their complete salad bar, meat service, and also all the side dishes that servers bring to your table (mashed potatoes, cheese bread, fried bananas, fried polenta, and meat croquettes). Check out their menus on their web site. Decided they are not participating DC Restaurant Week. Lunch and dinner menus on their web site. We emailed CommonWealth since it was not on their site. They sent us their menu and we posted it here. Extending the offering of the seasonal, limited Restaurant Week menu until September 6th. Their limited menu is posted on their web site. For lunch, you have a choice of the day's soup or salad for the appetizer, and the chef's entree of the day for the entree. For dinner, you have a choice of the day's soup or salad for appetizer, the chef's entree of the day for your entree and your choice of dessert. As well, you get a glass of wine. Not a great offering if you think about it. Lunch and dinner menus are on their web site. Scroll to the restaurant week menus. Looks like a faily limited selection from their normal menu. Their lunch menu is on their web site, a very limited selection from their normal menu. Finemondo is modifying the DC Restaurant Week offering and giving vegetarians a cheaper option for lunch. For lunch $20.09 gets you get any app., any pasta, any desert; $25.09 lets you add any meat or fish from their menu. For dinner, $35.09 you get any app., any pasta, any desert; $40.09 lets you add any meat or fish from their menu. So for dinner, you actually have to pay more than the standard offer if you like meat, however, you do get to choose from their entire menu. Choice of dessert: banana creme brulee, NY-style cheese cake, or chocolate walnut pie. Menu is on their web site. (dinner only) Third course: a choice of lemon pie, peanuts crunchy cake, sorbet or ice cream. Dessert: choice of warm apple spice cake, milk chocolate pot de creme, or the chef's tres leches. Extending the DC Restaurant Week offer through September 13th. Their menus are here. They seem to be offering their full menu, but I'm not sure what a "small starter" is. There are also some pretty large surcharges for most of the good fish entrees. Menus for both locations can be found on this page of their web site. The Heights is extending DC Restaurant Week for an additional week until Sept 6th. Details about their offering can be found here. I Ricchi is offering a smaller menu than normal, but they are calling it their full menu. You decide. Blue Ridge is offering their full menu for lunch and dinner. La Tasca always offers an unlimited Tapas menu for DC Restaurant Week. This is the current menu. Laporta's is offering their full menu with regular portions. Their current lunch and dinner menus are on their web site. Third course: Choice of berry shortbread, or gluten-free lime curd. Second course: Choice of seared rockfish, New York strip, or roasted chicken breast. Third course: tiramisu, tartan, and a selection of ice creams and sorbets. Fourth course: Choice of tiramisu, tartan, and a selection of ice creams and sorbets. Extending DC Restaurant Week from August 24th through September 6th. For lunch and dinner, Liberty Tavern is offering any 3 courses from their full menu. For dinner you also get a $5 coupon towards your next visit. Extending Restaurant Week an extra 2 weeks until Sept 13. See their menus here. Dinner menus are on their web site. Extending Restaurant Week until Sept 5th. Tosca offers their full menu for Restaurant Week. Restaurant Week - Wait, There's More! Another Restaurant Week has come and gone. As always, there were winners - restaurants that really took the opportunity to show off what they have to offer all year round - and losers - those whose treated it as more of a burden or, worse, barely gave it a thought. If you were out of town, busy, or just forgot, you may be thinking that you missed your chance to take advantage of those great Restaurant Week deals - $35.09 dinners and $20.09 lunches. But we wanted to remind you that you've still got more than 30 options this week, if you want to make up for lost time (or a bad experience last week). For reminders of what these restaurants are offering, check back at our original post. And for reservations (much more readily available than they were last week) through OpenTable, click on the restaurant names. No link means no OpenTable participation. Enjoy this chance to end February on a culinary high note!